I have fallen in love with not one, but two sports at the 2010 Olympic Games in Vancouver. Snowboard cross and ski cross are the events for me. Actually, I fell in love with them months ago. I was doing my internship with the CBC’s online unit and I was assigned a feature story on women’s ski cross world champion Ashleigh McIvor. In preparation for my interviews with McIvor, her coach Eric Archer and her mother Marilyn, I read as much as I could about ski cross and watched as much video as I could find online. I was hooked by the speed and surprisingly physical style of racing. I liked the skill and strategy needed to succeed. I loved everything about the sport after just watching a few races. Ski cross is the newest Olympic sport. After time trials determine seeding, heats of four skiers race down a course filled with moguls, turns and jumps. 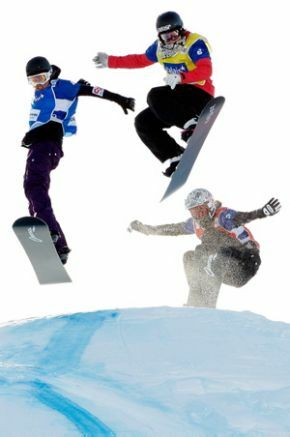 It was introduced to the Games without any trial period based on the popularity of snowboard cross at Torino in 2006. That’s the beauty of these sports: they’re so simple. Ski-cross and snowboard cross are very similar. The only real difference is what the athletes use to ride down the hill. Everything else is the same, including the course. Unlike most Olympic sports, ski cross and snowboard cross are very objective. Sports like figure skating, ice dancing or freestyle skiing are judged by officials and, unfortunately, can be marred by corrupt decisions. Too often politics have influenced the outcome of these events. However, with ski cross or boarder cross, anyone can understand that whoever gets to the bottom of the hill first, wins. There is much less opportunity for corruption or other subjective factors in such a straight-forward sport. They are a race, pure and simple. Although steroids can help athletes in any sport, ski and snowboard cross rely so heavily on technique that the possibility of a win tainted by performance enhancing drugs is much smaller. Another benefit is that Canadians are really, really good in these events. Mike Robertson won silver in men’s snowboard cross on Monday, while Maelle Ricker won gold in women’s snowboard cross on Tuesday. Canada’s ski cross team is even stronger. As I mentioned above, McIvor is the reigning women’s champion but the rest of the women’s team is also dangerous. Kelsey Serwa, Aleisha Cline and Danielle Poleschuk are all capable of winning an Olympic medal. Chris Del Bosco headlines the men’s team, but Stanley Hayer and Davey Barr are equally strong. Again, any one of them could leave Vancouver with a medal around their neck. In fact, there’s a good chance that Canada will pull down multiple medals in men’s and women’s ski cross, and I know that I’ll be watching every race with anticipation, and you should too.